This is Part 6, the final interview in our 6-part series. Please pray for Randy as he continues to grow in the Lord. “The Source Of Light Straight Ahead At The Crossroad Of Life” . Q1: Tell me a bit about your background, your age, where you grew up – that sort of thing. My name is Randal Aube. I go by the name Randy. I am 38 years old. I grew up in downtown Lewiston, Maine. I was married for 2 years. I have 7 kids – 4 of my own and 3 step kids. Q2: Tell me about your jail history; such as, how old you were when you were first incarcerated and how many years you have done in your life. I do not need to know what brought you to prison unless you would like to share. My first time ever going to jail was in 1995. It was for criminal mischief, a misdemeanor at 19 years old. My second arrest was in 2001 at 25 years old. It was for assault, another misdemeanor. This time makes my third time (at 38 years old). I cannot talk about it now because my attorney told me not to. Q3: Tell me about your experience with the Lord. What is your church background and how did you become the believer you are now? I grew up going to church from a baby until an adult. I became a Christian at 8 years old at a local Bible study for us inner city kids. That year, I started going to Bible camps as a camper. As I got older, I became a volunteer as a dishwasher, a cook and even a camp counselor. I have been in Bible camps in Maine and Pennsylvania. Q4: How has being saved changed you? When I first became saved, I was 8 years old. It changed the way I treated others. I still had a lot of growing to do. I hated school and was always getting into trouble. Q5: You are a very talented man. Would you share with us what your abilities are and in what craft you are skilled? I am a painter. I run my own business. I do many odd jobs – like paint, mason, roofer, landscaping and many, many more. I worked overnights at Hannaford as part of the night shift. We stock shelves. Q6: When you get out, what are your plans and will you be attending church? I am praying and hoping to be out in November 2014. My plans are to come back to jail to be a Bible study leader, maybe even a pastor. I plan to live 100% for God, to reach as many lost sheep as I can. Yes, I will be attending church. I will be going to my church, Marton’s Corner Baptist Church, most of the time. But, I will also be going to other local churches to see if others will help me in my plans to help those who are locked up. Q7: Is there anything you think you need to accomplish your goals? I guess I’m asking – Do you feel you have the proper support out there; from your family and more importantly, from the body of Christ [meaning, your brothers and sisters in the Lord]? The things I need to accomplish my goals is more and more Bible study, more time with God. I do believe that I have the proper support out there. My sister and her family, my church family and the one and only supporter I need – Jesus. Q8: Do you believe your faith has grown in here? How so? Yes, my faith has grown in here. When I first came to jail, I was not living for God the way I should have been. I was more of a “use it when I need it” kind of guy. But, now I have seen and heard God telling me this was my wake-up call I have been in the Bible every day from the 2nd day ’til now. I spend hours and hours in God’s Word. I do 4 different Bible studies – 2 are through the mail and 2 are through a pastor who came to jail to visit and help me grow. My first Bible study is with my Pastor Bob Putnam. My second is in the mail by Crossroad Bible Institute. My third is from Straight Ahead Ministries. My fourth is in the mail by Source of Light Ministries. Q9: In what ways has attending church services and Bible studies improved your time here behind bars? Attending church services and Bible studies has improved my time here behind bars by allowing me to see that God is with me; that God can use anyone to reach others – even use me! I have been blessed by God to have a Bible study in my cell with other inmates. One of the young guys has given his heart and life to Jesus! Praise God! I have also been given fellowship with other believers because of church services and Bible study. My faith in God has grown more in the last 8 months of my life than in the last 37 years. Q10: What advice do you have for other brothers and sisters who are doing time? Follow Jesus! Read your Bible daily. Try to find others who are also walking with God and always, always pray. Pray every day, read the Holy Word every day – not just once a day, but as many times as you can. Find a Daily Bread or other Bible-following books. Go to every church service and to every Bible study that you can. Even start your own Bible study. You can NEVER get too much of God. Keep your head and your faith up. Remember God is right there with you, even when you are at rock bottom! God bless you all. 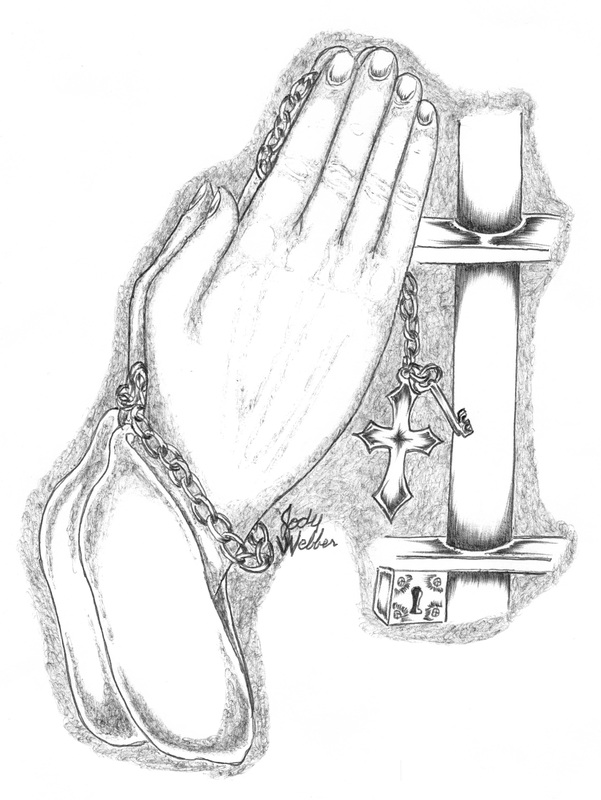 Please pray for my ex-wife and my children – for salvation, health, happiness and safety. The same for all my family members who do not have Jesus as their Savior. Please pray for my loved ones that do have Jesus. Keep them from the devil’s evil work, health, safety and blessings. Pray for all the prisoners around the world who are locked up and mistreated every day. Pray for their salvation – for them and their families. Please pray for the law officials – for their salvation as well. Please pray that God’s Word would become stronger and stronger in all the world’s jails and prisons. Please pray for me to be what God wants me to be and to accept whatever it is. Amen.